Gamification design still tends to attract game designers who are used to mature games – they create gamified experiences that try to cover all the bases. But all those currencies, levels and badges can add up to quite a few moving parts. Not something for time and cash strapped businesses to attempt. A diagram outlining the approach. Focus on the player’s personal journey – start with the player’s goal in mind – what do they want to achieve? Who do they want to become? i.e. if you are a retailer don’t offer a loyalty program – that’s ‘company centric’ thinking, instead offer feedback on “how much of a sustainable shopper I am” and coach me in how I can become more sustainable in my purchasing decisions. Prioritise implicitly tracked metrics – in lightweight gamification, we don’t expect the player to adapt their behaviour to our program, we’re humbler than that. Instead, we track the activities they are already doing and provide better feedback for them against their intended goal. Throttle the feedback to sustain engagement – don’t expect players to keep checking in and seeing instant, fast feedback, in lightweight design thinking, we don’t expect our players to be that interested – instead we offer timely, throttled feedback at appropriate intervals. Our objective is to carve out 2 minutes of someone’s time each week to check where they stand on a leaderboard. That’s usually enough to help players optimise their behaviour on a regular cycle. The diagram is split into two halves – upper and lower (above and below the arrow taking the player toward their goal). In the upper half, we see lots of white space as the Player seeks to reach their Epic Goal through disciplined activity – to lose weight for example by dieting or to become a better Gamification expert through engaging in gamification conversations on social media…. there is little added that gets in the way of their goal – i.e. we’ve not added any new required behaviours. In the lower half, we have the feedback we can give each player split into three levels – a novice leaderboard for those at the beginning of the journey, an enthusiast leaderboard where most people play and a master leaderboard at the end for the real maestros. At the top of each leaderboard (reaching a certain score / certain percentile) you can promote players to the next board (levelling up). You can award them a single badge for doing so. Simply being on a leaderboard is in this case the badge, there is no need for a specific visual element. Though there’s no harm in having one if you want to create one. The leaderboard can be soft or hard and rendered in any way you like – i.e. as a leader cloud – it doesn’t have to be a straight competitive leaderboard it could be something simpler like – everyone who has achieved 100% of their quota. The throttled regular feedback is a weekly or monthly notification sent from the leaderboards (via email / twitter) letting the player know how they are getting on. We’ve put this technique to good use in the Exaleague where I’ve created 3 divisions and provided feedback to companies on their social media marketing progress. You can see more on this in myslide deck on Lightweight Gamification. You can use leaderboarded.com to implement this approach. Contact us directly to request access to a 1 hour training session which will be done via webinar. 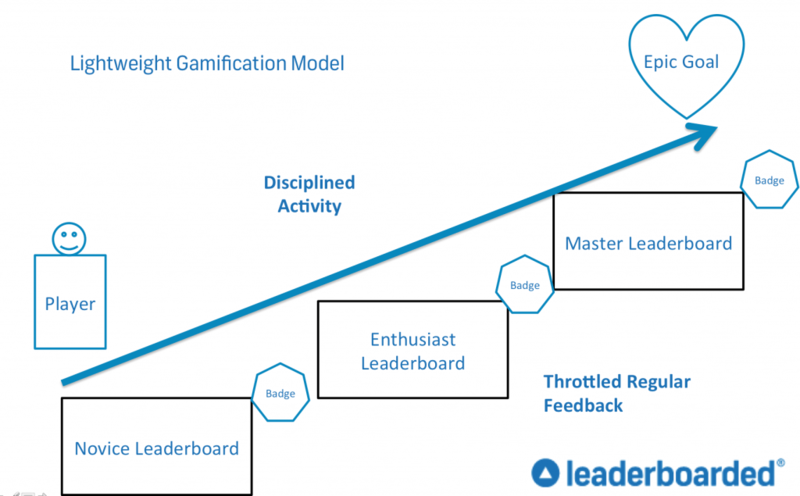 Finally, here’s a comparison table comparing lightweight and heavyweight gamification. I believe both approaches have their place – but lightweight definitely provides an awesome bang for buck and is a great place to start on your gamification journey. ← How pull marketers use Rise as their engagement platform to keep customers in orbit.